Vanilline is made from the same nourishing ingredients as Vegaline, but with the sweet and tart scent of vanilla. Vanilline is made with simple, 100% natural ingredients. Vanilline will help your skin feel soft all day long. 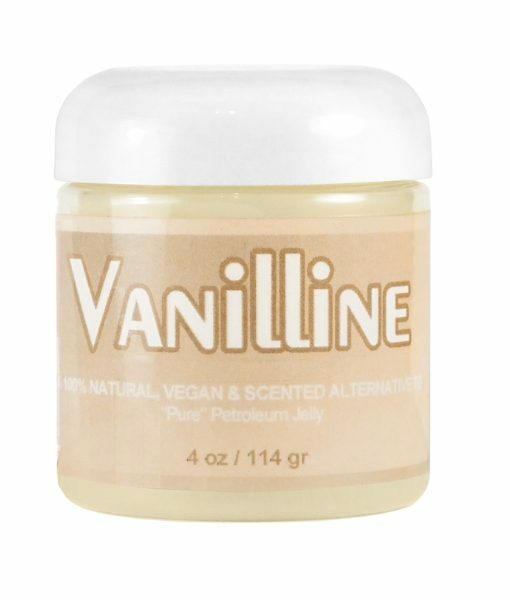 With properties that will keep skin feeling hydrated, Vanilline can be used for: moisturizing the skin, keeping lips soft, styling and nourishing dry and brittle hair, keeping your body moisturized, helping cracked and dry heels and feet and everything else “Pure” Petroleum Jelly is used for! Vanilline can be used as a moisturizer by those with sunburns, dry skin, blemishes & acne, rashes, sensitive skin, cracked lips, cracked heals, eczema, and irritated skin. ( * = Certified Organic) Ingredients: *Safflower Oil, Soy Wax, Candelilla Wax & *Flavor Oil. ( * = Certified Organic) *Safflower Oil, Soy Wax, Candelilla Wax & *Flavor Oil.